This week’s Shadowhunters had a major development in the plot. It’s so tempting to talk about it now, but it’ll have to be saved until the end. For now this review will start with the low points of this episode; Alec and Isabelle. Even though the siblings did get some screen time this episode it felt cut short. They had a conversation between each other, but it felt like the same old dialogue, which is a shame since Isabelle is trying to change her lifestyle. The few moments we see of this new Izzy is interesting, but there wasn’t enough to truly understand how much she’s willing to change for her family’s sake. Hopefully that will be explored in further episodes. Another great moment lost in this episode was when Alec tried to flirt with a police woman. The scene was short, but a few more seconds of awkwardness would’ve been better, especially since he’s not into women. Alec and Izzy weren’t the only ones who had a run in with the law. Luke ran into trouble with his own precinct. Turns out his past actions from previous episodes are catching up with him and now he’s the lead suspect in a murder investigation. In spite of the trouble it would’ve caused his character it was nice to see that the police in this world don’t let things slide by them. It shows just how careful Luke actually has to be at work. Luckily for him he’s in the clear for now. It would be pretty hard to explain to his superiors that he was defending himself and had to turn into a werewolf. Due to Luke being investigated Jace and Clary had to take matters into their own hands. Clary’s plan was funny and clever. Making Jace look like a bad boyfriend turned out pretty well and it was really entertaining. Unfortunately that plan didn’t work, but if it did then it would’ve been too easy. This made them go with Jace’s plan. Taking out the power was a wise play and it also got Clary to embrace another rune. It’s power was only seen for a couple seconds, but it’s always nice to see the runes that Shadowhunters have in their arsenal. The mere mention of power provokes thoughts of Simon. Alberto Rosende’s acting was really on point this episode. He stole the show with his portrayal of Simon trying to keep it together as he slips deeper into what he believes is vampirism. It was hard to blame Simon though with all the hallucinations he kept having. The illusions included vampire teeth, blood coffee, naked Clary. Yes, naked Clary. That image made sense given how much he likes her and since he’s a teenage boy, but man it came at the worst time ever. As if it wasn’t bad enough that he hooked up with Maureen, but he called her Clary while she was liking next to him naked. No one should have to go through that from either end of that conversation. To make matters worse, now his family thinks there is something serious wrong with him. It’s most likely because of that awesome scene where he broke his table, but hey, you try keeping your enhanced strength in check. If that wasn’t bad enough now he might actually be turning into a vampire thanks to what seems like Camille biting him again. Oh Simon, when will you get a break. The people that did have things go their way was the Shadowhunters. After following Jace’s plan Clary was able to obtain the card that had the Mortal Cup on it. At first she couldn’t get it out the card, which was probably a good thing since the group was instantly attacked by demons; one of which who was an old lady. The Shadowhunters managed to get ahead of them, but they had to split up, especially when the Shax demons showed up, which didn’t make sense because splitting up isn’t always the best strategy. Also they were making quick work of all the demons before that so the urgency didn’t make any sense. Regardless, Clary was able to grab the Mortal Cup out of the card! She even used it to make some demons run away. The Mortal Cup worked on the Shax demons, but not the Shapeshifter. Clary saw right through it’s fake Jace form and stabbed it, but the showrunners decided to play with the audience’s heart strings. The demon didn’t immediately evaporate so it wasn’t clear whether she got the demon or actually stabbed Jace on accident. It turned out to be the Shapeshifter, so everything was okay. I personally think it would’ve been better if it was the real Jace or if the episode ended with us knowing because it would’ve generated a whole lot more drama, but I’m not in charge of anything. 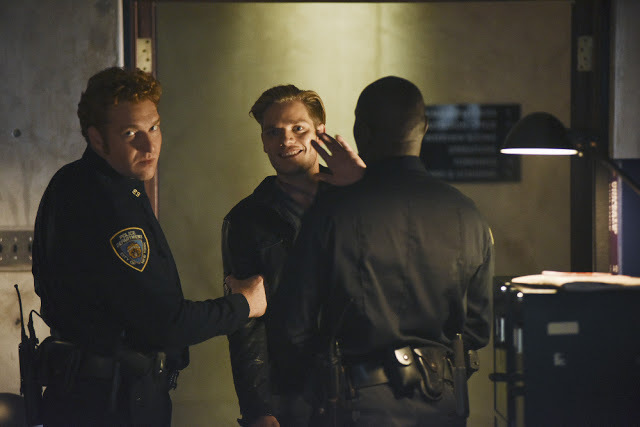 Due to the fake out Clary was more than happy to see the real Jace at The Clave. She even gave him a big kiss! Alec didn’t like that at all. I know Jace must’ve because of all that sexual tension they’ve been building up through the previous episodes. We’ll see how Simon handles it. Side Note: R.I.P. Captain Vargas. Demons need to be stronger. Previous ArticleTV Review: 'Pretty Little Liars' 6×17 "We've All Got Baggage"